ISI abbreviation: 4OR-Q J Oper Res. This website is maintained by the editors of the journal and contains some relevant information for readers, contributors and referees. 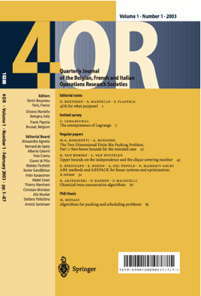 The main website with tables of contents and online papers is on SpringerLink. For all submissions and the reviewing process, we use the Editorial Manager.